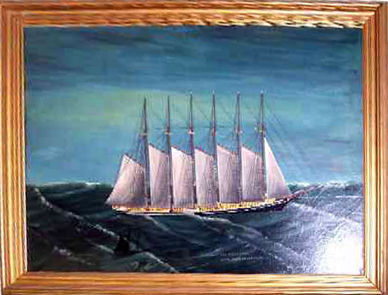 Presented here, a wonderful folky painting of the Alice M. Lawrence who was shipwrecked in a hurricane on December 5, 1914. She was the the fifth of ten, six-masted schooners built under contract for the J.S. Winslow Company of Portland Maine. Constructed: in 1906, at Bath, Maine by Percy and Small. Construction details: Built of white oak and yellow pine she was fastened with galvanized iron and copper fastenings; 2 decks, full poop; fitted with electric running lights, an 800 candlepower searchlight and 75 incandescent lights in its quarters and work areas. Dimensions: length 305.1 ft., width 48.2 ft., depth 22.6 ft.
Tonnage: gross 2230, other draft 3132. Machinery: steam operated pumps, ten horsepower generator. Cargo: empty. Presumably on a voyage to bring coal from Newport. The schooner Alice M. Lawrence struck Tuckernuck Shoal off Nantucket Island, the evening of December 5, 1914 while "bound light" (without cargo) from Portland to Norfolk, probably to pick up a cargo of coal. Heavy seas soon opened her seams and it would have filled completely if not for her powerful steam operated pumps. Running almost constantly, it was all they could do to stem the rising flood. The Revenue cutter Acushnet went to the Alice M. Lawrence's assistance and would have pulled it off, if not for the fear of the schooner's captain that it would fill with water and sink. A wrecking tug from New London was soon alongside the schooner with hopes of refloating it. 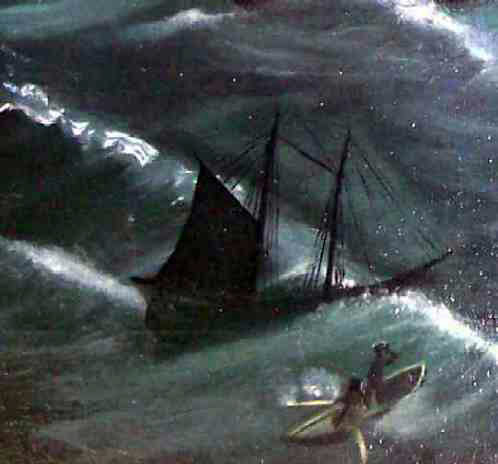 However, the evening after it struck, 60 mph winds drove the schooner higher on the shoal and seas battered it heavily. Subsequent gales broke the vessel's back before local wreckers could attempt to refloat it. On December 14th the crew abandoned ship after having stripped it. Fortunately, no lives were lost. Above is a detail of the foreground of the painting, which is very well done. The title seems tranquil enough . . ."Lifting of Fog Maine Cost (sic) Capt. Louis Gallovich." Now, while Capt. Gallovich was not the Master when the vessel sunk, he may have been at some earlier time. No way to know for sure. What we do know is the painting was done by someone who knew the vessel and knew the sea. It is powerful in it's simplicity and its ability to draw the viewer into the situation. It is in excellent condition. Size is 25" x 32".